Springtime, with its warm temperatures, fresh seasonal produce and the opportunity to eat outside again, is the perfect time to kick your family’s eating habits up a notch. Fresh air and sunshine seem to put most people in the mood for fresher, lighter meals rather than heavy ones, making fruits and vegetables the main focus of many spring dishes. Apricots are in season during the spring, so take advantage of this yummy fruit! An easy snack that’s full of nutrients and calcium is apricots stuffed with cottage cheese. Halve your apricots, spoon in some cheese and drizzle with honey or sprinkle with nuts for a little something extra. Baked sweet potato fries are a healthier alternative to the French fries, gloppy potato salad and potato chips that are sure to start popping up at cookouts this spring. Make your own or look for premade ones in the freezer section of your grocery store. Eat them alongside a sandwich or dip them in yogurt or ketchup for a yummy snack. You can bake other veggies too: roasted carrots, baked onion rings and baked dried strawberries also make great snacks. Speaking of yogurt dip, it’s one of the easiest and healthiest spring snacks out there. Mix yogurt with curry powder, honey or maple syrup for a healthier dip option this spring. You can choose whatever dippers you like; fruit, sweet potato fries and cinnamon pita chips all taste great dipped in something a little sweeter! Smoothies are the perfect spring snack because not only do they cool you down on a hot day, but they’re good for you too. Use yogurt, fruit and your favorite juices to experiment with various smoothie combinations. To add some additional nutrients, blend some spinach in with the fruit—kids won’t even notice. Keep whole grain pitas around your house this spring; you can use them for dozens of delicious, healthy snack ideas. Melt some cheese between them for a simple quesadilla, bake them into homemade pita chips or spread on marinara or BBQ sauce and sprinkle a little mozzarella on top for a healthier take on pizza. Try this easy curried yogurt dip for a simple spring snack perfect for dipping with fruit, pita chips, sweet potato fries or any other snack you can think of. Enjoy! Blend all ingredients together. Chill and serve. Optional: Drain the yogurt in a cheese cloth for a thicker, richer dip. Author Bio: This is a guest post by Meredith K. on behalf of Alexia. For more easy dip recipes and frozen appetizers to dip with, visit www.alexiafoods.com. I loved baked sweet potato fries! My kids love yogurt! My son would eat it all day if we would let him! Yum! 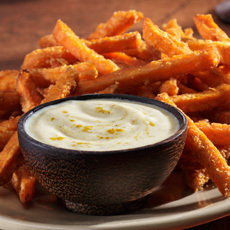 We love to make our own sweet potato fries. My kids love yogurt too, though I’ve never made it into a dip before.